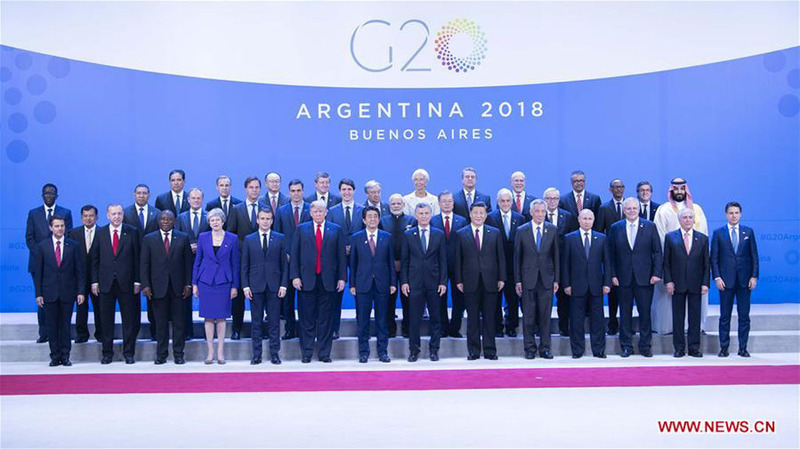 The 13th Group of 20 (G20) summit was held in Buenos Aires, capital of Argentina, from November 30 to December 1, 2018. At present, populism and protectionism are on the rise globally, President Donald Trump has continued withdrawing the U.S. from a series of international organizations and agreements, and doubts are mounting on the value of multilateralism and global governance. In this context, despite being a dialogue platform for leaders of the world’s major economies, which together contribute 85 percent of the global GDP, 75 percent of international trade, 80 percent of world investment and 66 percent of global population, the G20 is still seen by some as an eye-catching but otherwise a useless “talking shop.” Therefore, it is understandable that people pay greater attention to bilateral meetings and temporary discussions on the sidelines than the main event. So, is the G20 useful or not? Looking back at the past decade since the 2008 global financial crisis, people have reached wide consensus on the remarkable achievements of the G20 in uniting emerging and developed economies to address global crises together, enhancing global banking regulation, and combating tax evasion. Today, the G20 has become less sought-after than before. Perhaps this is just because the world isn’t facing a global crisis as it did ten years ago. The International Monetary Fund (IMF) predicted that the world economy will grow by 3.7 percent in 2018 and 2019, a record high since the 2008 global financial crisis. However, at the same time, global debt also hits a new record. This year, Argentina, the host country of the G20 summit, fell into economic turmoil and is receiving emergency bailout loans from the IMF. Trade conflicts are becoming worse and worse around the world. All of these pose major threats to the future development of the world economy. In the coming years, perhaps coping with crises will remain the major function of the G20, but this shouldn’t be its only job. Many argue that the group is becoming “useless” because its agenda has been over-expanded, resulting in low efficiency. In the long run, however, this will become a reason that the G20 will definitely play an important role in international affairs. Against the backdrop of anti-globalization threatening long-term sustainable development of the global economy, it isn’t enough for advocates of multilateralism to only make vows. It requires the G20 to play its unique role as the center of the global governance network. While uniting and mobilizing forces supporting multilateralism across the world, it needs to be more open and inclusive, provide more direct and effective channels for vulnerable groups to express their interest demands, and facilitate the reconciliation between globalization and anti-globalization, so as to achieve the widest consensus on fairer and more sustainable global development. This is a fundamental connotation of the concept of “global governance” that took shape at the end of the 20th century. In this sense, behind the expansion of the G20 agenda is a higher-level need. That is, the G20 is supposed to provide an open, flexible platform for various values and interest appeals such as innovation, growth, efficiency, fairness, green development and inclusiveness to reach important consensus while mitigating the damage from unilateralism and extremism. It requires long-term, painstaking efforts to achieve this goal, but no other mechanisms can provide the facilitation as much as the G20. First, this is because of the G20’s wide representation. Nowadays, the G7, a bloc representing the interests of developed economies, has become a secondary group equivalent to BRICS (Brazil, Russia, India, China and South Africa) and MIKTA (Mexico, Indonesia, the Republic of Korea, Turkey, and Australia) under the framework of the G20. Second, this is because of the G20’s multilevel institutionalization. Today, the G20 has developed into a trans-governmental, multi-layered international exchange mechanism, backed by strong intellectual support from a variety of international organizations including the Organization for Economic Cooperation and Development (OECD), the IMF, the World Bank, the World Trade Organization (WTO), the International Labour Organization (ILO) and the International Energy Agency (IEA). Third, this is because of the G20’s openness. More than just a dialogue platform for governments of its 20 members, the G20 has formed a wide array of communication mechanisms targeting non-member states and other regional organizations as well as different social groups like businesspeople, think tanks, non-governmental organizations, youth and women. Currently, the G20 hasn’t been and shouldn’t be “hijacked” by trade wars. Rather, people need to look into its role with greater patience and from a long-term perspective. In the tide of the new round of technological revolution, the digital economy became a highlight at this year’s G20 summit. Participants discussed the opportunities and challenges brought by technological innovation and automation. This is conducive to shaping a medium and long-term agenda for the inclusive, sustainable development of the world economy. In a time when the global economic landscape is undergoing profound changes, what kind of multilateralism and global governance does the world need? China will work together with all other countries to gradually turn their common vision into reality through candid communication and pragmatic cooperation. The author is an associate research fellow with Shanghai Institutes for International Studies.